Newberry College received a B.
Washington Monthly's ranking of 190 out of 346 of Baccalaureate Colleges - Overall Rank was a major contributor to this grade. Tiny Newberry College, which is about 30 miles from Columbia, provides a liberal arts education with a special connection to its Evangelical Lutheran heritage. Describe the type of student who should not attend Newberry College and explain why. Describe the type of student who should attend Newberry College. Why? The type of student that should attend this college is one who enjoys a small college community in a small college city, enjoys one-on-one communication and closeness with professors, and the comforts of home-away-from-home. What is a typical Newberry College student like? Describe the type of person that should attend Newberry College. What are the top 3 reasons someone should attend Newberry College? What was a typical Newberry College student like in high school? Describe the type of person that should attend Newberry College. 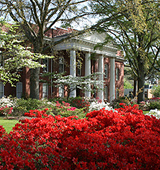 Founded in 1856 by the Lutheran Church, Newberry College is a small liberal arts college with a beautiful 90-acre campus in Newberry, South Carolina. Our modest size allows us to offer a personalized experience in higher education, with a 17 to 1 student-teacher ratio. Small classes allow our faculty to build relationships with their students and offer them individual attention and guidance specific to their needs. Our size also affords us the agility to react quickly to changing market needs. Larger institutions may be mired in old patterns of learning that are no longer relevant to today's graduate, who will likely have many different jobs at different companies over the course of his or her career. A global economy mandates creative and original thinking, a skill that we cultivate in our students. Our cross-disciplinary education platforms stimulate critical thinking and allow for creative problem solving, setting students up for a lifetime of success. What are the top 3 things that students do for fun at Newberry College? The top three things that students majority do for fun are attend an event sponsored by All Campus Entertainments, attend events sponsored by a non-profit Greek-lettered organization, or attend the in season sporting competitions. Campus housing is available for undergraduates. Housing deposit : $175.00. Housing deposit due : May 1. Housing deposit is partially refunded if student does not enroll.. Freshman allowed to have car. No pets. The average student pays $19,091 for tuition, fees, and other expenses, after grants and scholarships. Total stated tuition is $22,050, in-state and on-campus, before financial aid. Learn more about financial aid at http://www.newberry.edu/admissions/financialaid.aspx. Estimate the net price for you at http://npc.collegeboard.org/student/app/newberry. Newberry College participates in the NCAA Division II for college athletics. Want more info about Newberry College? Get free advice from education experts and Noodle community members.